Love the look and feel of leather? Then try the new Bellows collection designed by Toan Nguyen on for size. This chic furniture collection by Walter Knoll boasts an elegant look and a luxurious feel that raises the bar on your home decor. The Bellows Dining Table echoes that same style in its base, topped by a delicate, round glass tabletop, made for socializing and enjoying. It’s woven and it’s wonderful! Designed by Johannes Foersom and Peter Hiort-Lorenzen for Cane, this cool outdoor furniture offers all the casual charm of rattan but with a contemporary twist. The elegant Savannah furniture line features sophisticated silhouettes finished in black and outfitted with comfortable yet chic upholstery that invites you to admire it from near and far. 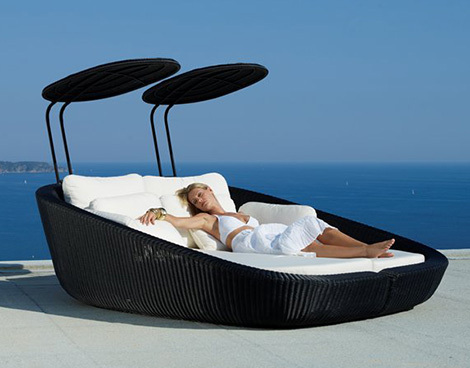 This full range of modular furniture includes seating, loungers with integrated parasols, and matching low tables that double as coffee tables, side tables or footstools for a cohesive look by the pool, on the deck or in the yard. For more details visit Cane. Conceived by Martin Steininger of Vienna-based Steininger Design, these unusual concrete kitchens are as quirky as they are cool. While you might not typically consider concrete as the material of choice in your kitchen makeover, it’s a great choice for a number of reasons such as its heat resistance and hygiene qualities, not to mention its sleek its aesthetics. 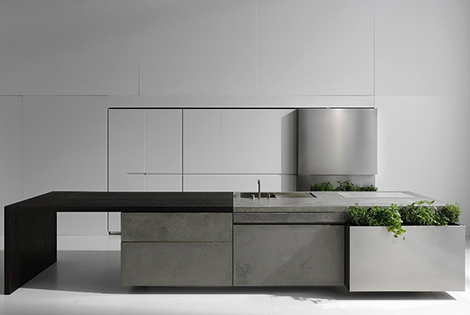 These kitchens are made using ultra-thin 8mm concrete that delivers on the durability and style side of things alike. Pair this versatile concrete island with wood for a contemporary yet rustic look, or go the ultra-modern route with a chic stainless steel. Steininger Design. Designing “domestic landscapes” since 1870, Acerbis International presents these modern book shelves and sideboards, made for fashion and function alike. Created for the Italian company by designers Gabriele and Oscar Buratti as part of the new 2010 collection, the Newind book shelves are cool and contemporary, boasting space-efficient qualities as well as made to contain electronics – and all their unsightly wires and cables – in style. 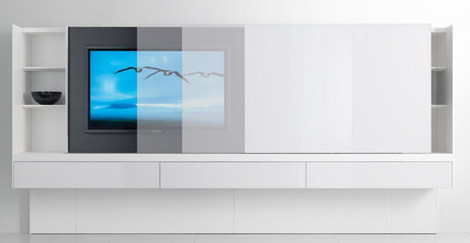 The display shelf in particular is ultra cool, featuring a sleek sliding glass panel that conceals the TV when not in use, slides open when you feel like watching the tube. The TV even slides over to reveal hidden rear storage. Finished in black and white, these modern shelves and sideboards boast a timeless style to suit every space. Check it out at Acerbis International. 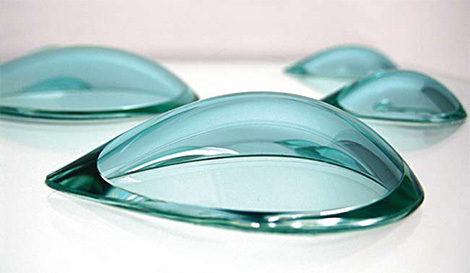 Italian company Micron has come up with these unique lighting fixtures for home which are its top product to date! The Queen crystal collection is the mother of elegant, elaborate illumination, boasting a chrome structure with crystal rings in a range of hot hues like clear, red, amber, black and purple – how dramatic! 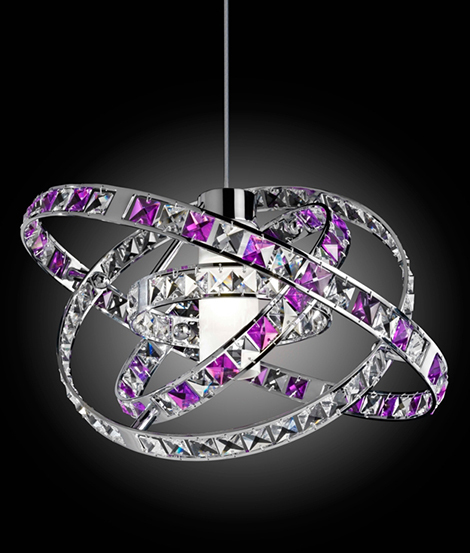 These pendants and chandeliers are configured with a single cluster of crystal rings forming a stunning centerpiece, or with multiple crystal configurations to bring some bling into your modern foyer, living room, dining room or bedroom. The Queen lighting fixtures come in coordinating wall-mounted, ceiling-mounted, table and floor lamp designs, and will undoubtedly become the crystal crowning glory of your decor. Check out this unique lighting collection at Micron. 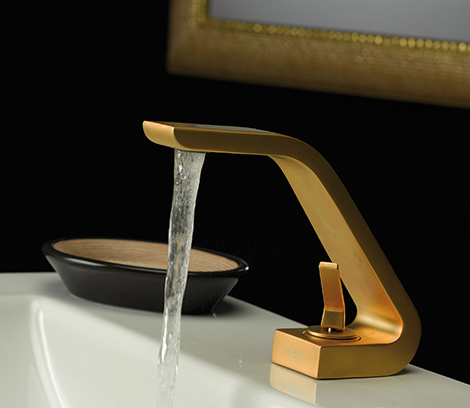 Nothing says “luxury” like these Italian style bathroom faucets by Webert. The new Wolo bathroom collection puts a modern spin on traditional lavish treatments with its signature sleek lines inspired by the flight of airplanes and the aerodynamics of their wings. Designer Massilimiliano Settimelli is already enjoying a successful and established career, having designed interior decor, lighting, furniture and bathroom accessories and faucets. And now, making the bathroom into a room you linger a little longer in, this new bathroom collection features chic, coordinating pieces that include the single-level lavatory and single-lever vessel lavatory, a widespread lavatory, shower and bathtub fixtures. These Italian style faucets come in chrome, satin gold, black and chrome, and white and chrome finishes. For more info visit Webert. 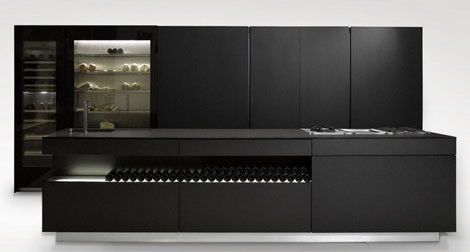 We love the Alu kitchen’s wine and cheese theme. Designed by Martin Steininger, this new specialty kitchen offers everything for the wine connoisseur just short of the wine itself. This entertainment island offers stylish under-counter bottle storage and boasts an integrated concealed compartment for wine and cheese degustation silver ware. 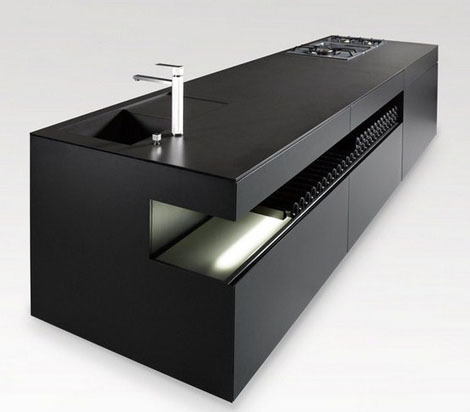 Add to that a sink and a sleek, transparent-door fridge and you can practically smell the urban-chic style cooking. 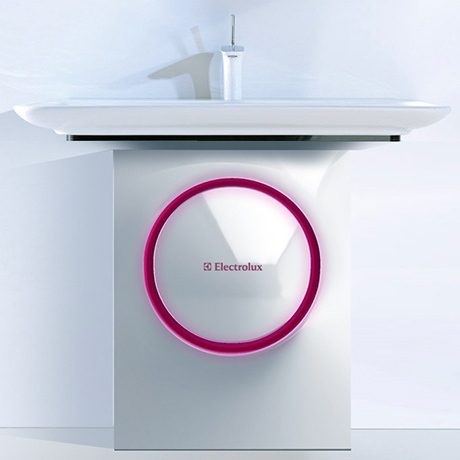 Electrolux has recently posted about Shine – the newest compact washing machine concept. We find it interesting how perfectly the freestanding Shine fits under the sink that is a part of PuraVida bathroom collection by Duravit. Like it was designed to match PuraVida’s style. A smart solution for a compact bathroom. There is also a wall-mount version that integrates nicely with the PuraVida vanity. Morning, noon and night – the total spa experience is at your disposal with this new complete home spa by Jacuzzi. Inspired by the highest sense of wellness, the Sasha home spa combines a sauna, shower and a hammam in one. 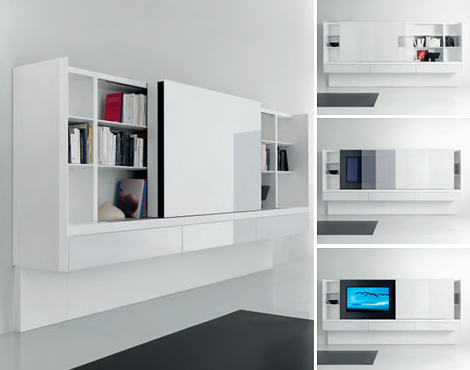 Designed by architect Alberto Apostoli, the Sasha boasts contemporary design and professional services in a compact package that fits any modern home. Made from wood, glass, steel and resin, Jacuzzi’s spa will engage all your senses with water, aroma, heat and music. 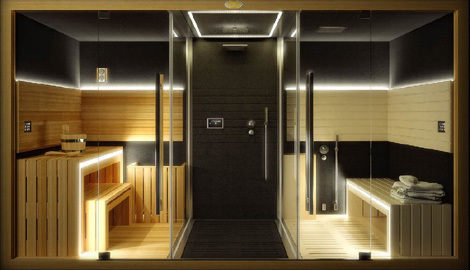 In the sauna, rgb LED lights are found inside the bench and on the wall panel, while a touch screen pad lets you choose different programs combined with color sequences. 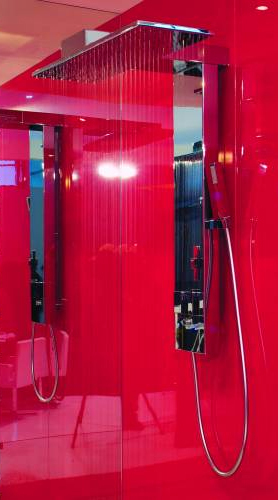 The shower is surrounded by large glass panels and comes with three relaxing water programs to wash your cares away. Finally, the hammam coats your body with warm dew, while the touch screen panel allows color to intermingle with the different preloaded programs. To learn more about Sasha complete home spa, visit Jacuzzi. You’ve got to love design that can multi-task. Offering 3 designs in one, the Totem rain shower column, made by Italian company Tender Rain, can be adjusted to give you three stylish looks. Boasting a masculine design, the Totem is a shower necessity for today’s trendy man. With a shower head that can be positioned in the center, off to one side or facing out toward you, this Tender shower column is sleek and cool in stainless steel, making it a study in sophisticated minimalism and ensuring it matches any bathroom decor. Perfectly balancing lines and shapes, the Totem will have you wishing you were dirty all the time! To see this shower design and others, visit Tender Rain. What a fantastic sofa … in a classic modern fabric. Looking comfy, stylish and sophisticated with its trendy floral accents, the new Forum modular sofa by Linea Italia will create a beautiful statement in a modern or transitional living space. This fabric is a real treat for the eye. Also available in leather or microfiber, and supported by a wooden frame, the Forum sofas are comfortable to boot. Multiple compositions can be obtained using straight and angular modules that are hold together by retractable metal hooks hidden underneath. There is also a pouf that can be added to this fabulous ensemble. Sitting low to the ground, the Forum’s angular dimensions allow it to fit perfectly into any space, whether it’s in the middle of the room or nudged up against a corner. 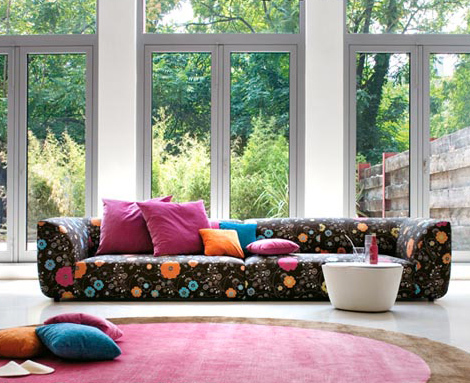 For more information or for fabric choices, visit Linea Italia. Covering off the three bases of decor – living, dining and bedroom – the new NOX sustainable furniture line from Team 7 offers all your home essentials in one cohesive collection. Created by award-winning European designer Jacob Strobel, the modern collection features wood, beautifully yet eco-consciously finished with only non-toxic, herbal oils and waxes. 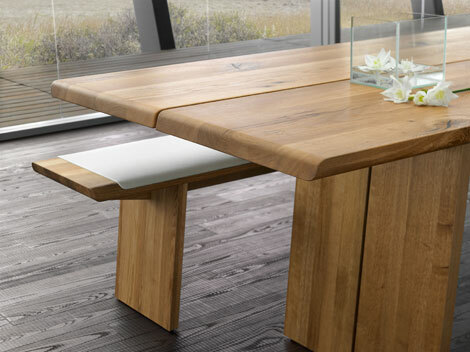 Tables come with the option of wood A-line legs or polished stainless steel, which puts a modern twist on tradition. Your cabinets echo the warmth of wood with the contemporary touch of glass. And we love the wood bench, which is finished with leather. We’d place it with a rustic, knotty barn-board table for a country-kitchen look! For more information on the new NOX sustainable furniture line visit Team 7. Set your home a-bloom with flowery inspirations from the Deko Collection by Cast. 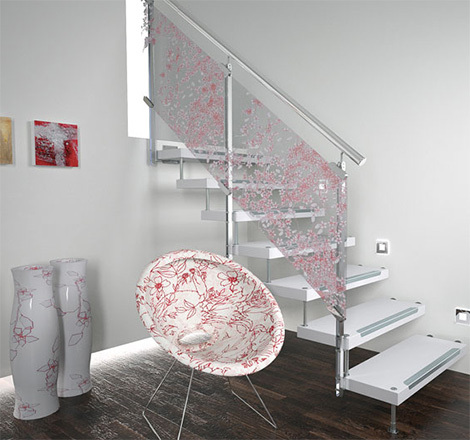 By inserting top-quality Kvadrat design fabric between plates of stratified tempered glass, Cast has created a staircase that gives the impression of an ascending or descending garden with every step you take. By harnessing the original aesthetics of the staircase, the Deko Collection gives a new stylistic interpretation of space to living areas. These delicate bouquets aren’t limited to staircases – Cast also offers these verdant designs in pictures, decor and other delightful ideas that will brighten any home. 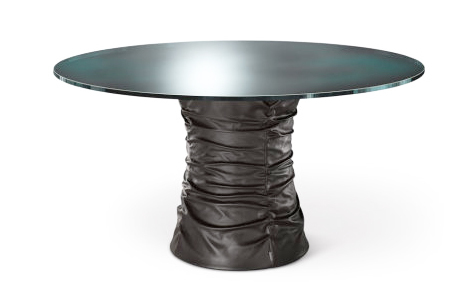 Also available are matching accessories such as limited edition glass fiber vases and chairs adorned with delicate, hand-crafted embellishments. For more information about these designs, visit Cast.